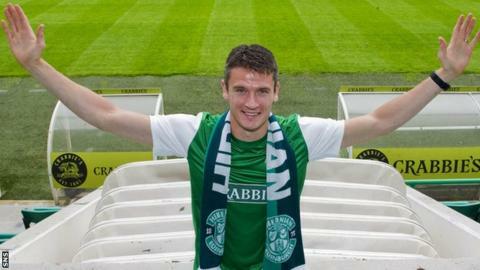 Owain Tudur Jones is looking forward to a taste of European football with Hibernian next month. The 28-year-old Wales midfielder signed a two-year deal at Easter Road after rejecting an offer to extend his stay with Inverness CT.
And the Edinburgh side will take on Ireland's Drogheda or Malmo of Sweden in the Europa League qualifiers. "I can't wait," Jones told BBC Scotland. "It's something different to the SPL." Jones experienced Romanian opposition in the Uefa Intertoto Cup during his days with Bangor City and thinks a trip to Sweden is more likely for his new club. "Malmo are a recognised name," said the former Swansea and Norwich player of the 1979 European Cup finalists. "Historically, they are the bigger side and probably the side you would expect to face. "In Ireland they are midway through their season, so they will be fit and match-ready. "Both teams will provide stern competition. "The Irish team would be more like an SPL game, full of blood and thunder, whereas Malmo will probably be technically a bit better. "It's just something you can look back on at the end of your career and be thankful for having had different experiences." Malmo are 14 games into their domestic season and sit third in the Allsvenskan table, while Drogheda lie eighth in their Premier League - 17 matches into the campaign. Hibs begin their friendly programme with a trip to Dumbarton on Saturday and will warm up further with a trip to take on a Gibraltar XI before meeting Nottingham Forest in the Algarve. "It's always nice in pre-season to get away from the training ground you'll be spending all season at," Jones added. "It will be a good test for us before the European games."